You can make a centerpiece in most any container as long as it is the right size and shape for the arrangement to fit on your table. 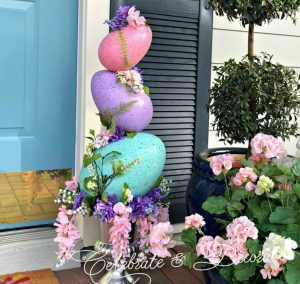 Today I wanted to show you that you don’t need to invest in a special container for a centerpiece. 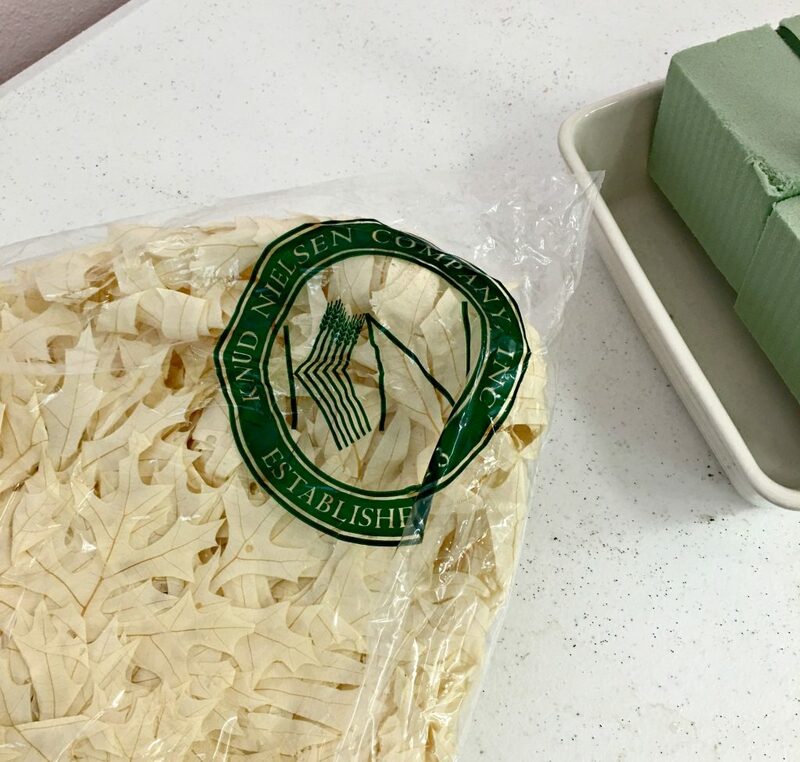 I selected this casserole dish from my kitchen cupboard to show you how even a casserole dish can be the base for your Thanksgiving table centerpiece. I began with three green wood wired sticks and a piece of anchor tape. You can wrap the wires around the sticks or cut them off, they are not going to be needed. 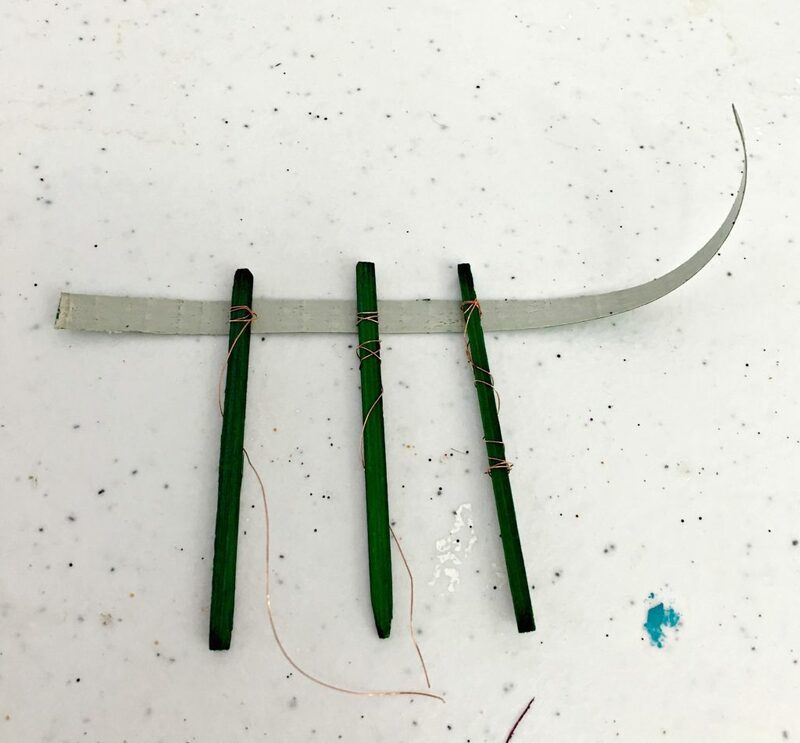 Put down a piece of anchor tape about 6 inches long and lay three green sticks on it, each about 1/4″ apart. 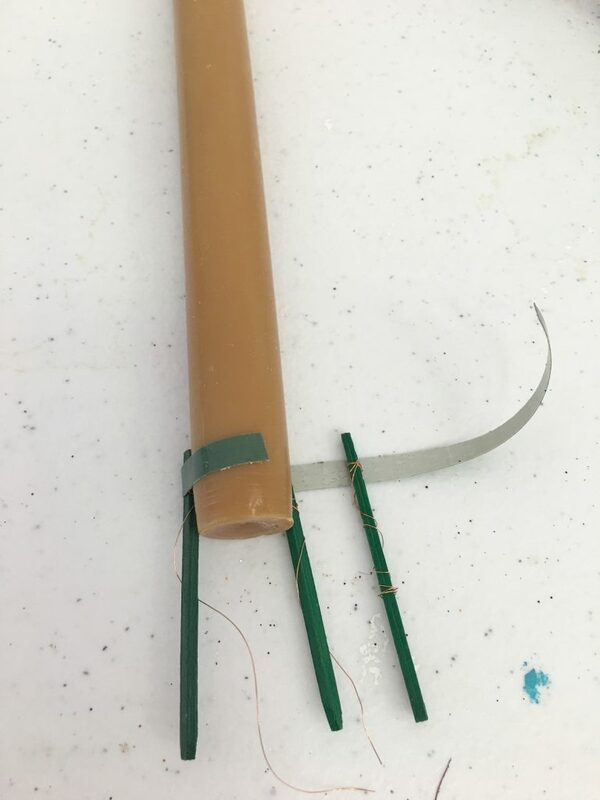 Put a taper down on the tape between two of the sticks and then wrap the tape with the sticks around your candle snuggly. 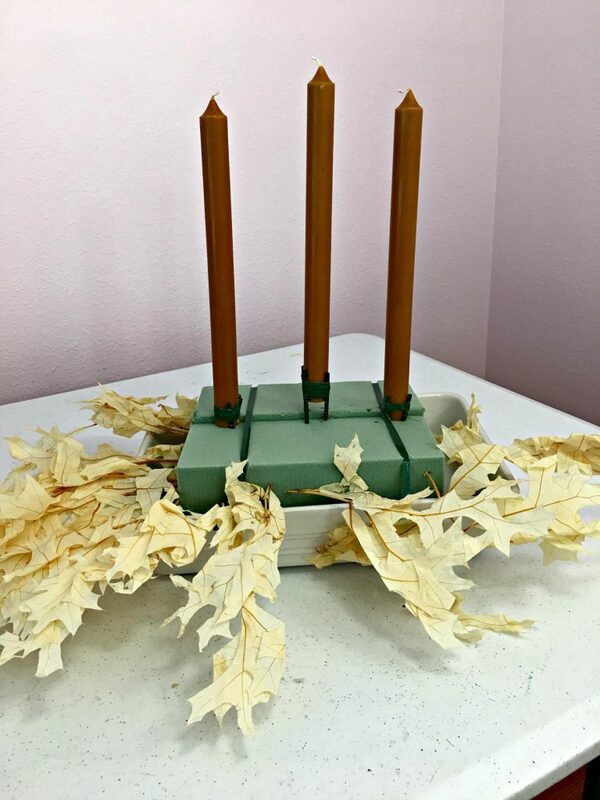 Do this with three taper candles and set them aside for a moment. The next step is to prepare your dish. Whatever container you choose to use, place a block or two or three (as many as needed for your container) of dry floral foam in it. 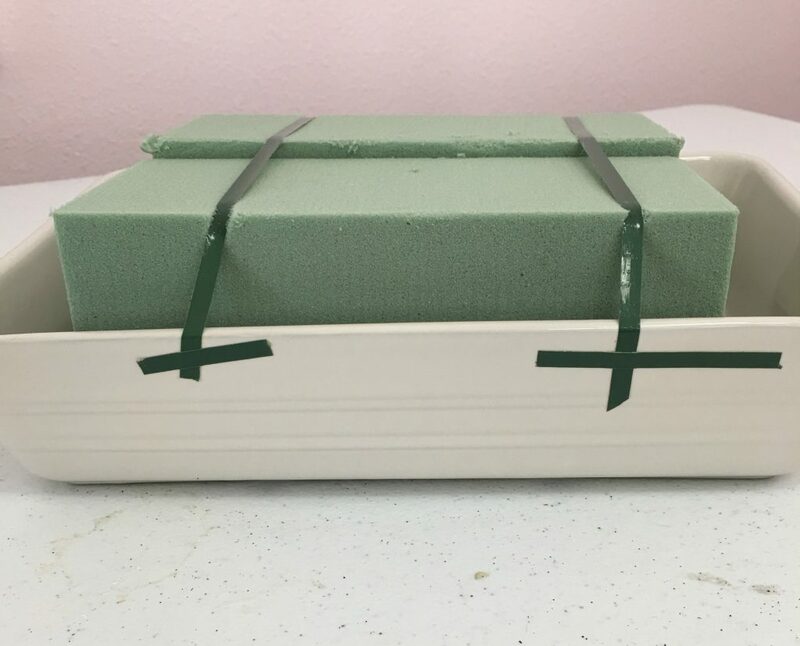 Secure the foam with anchor tape as shown. 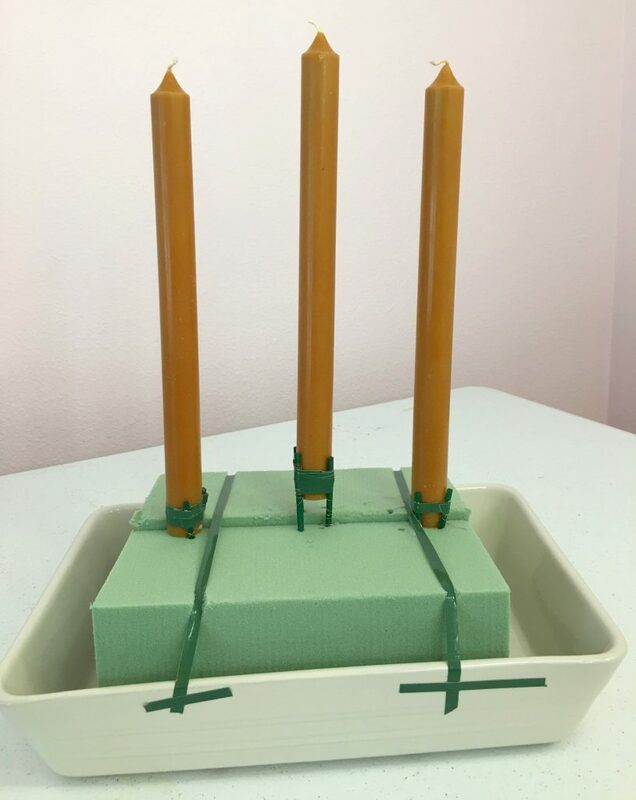 Take the three tapers and place them securely into the dry floral foam using the sticks to secure them. I like to have my center candle a little higher than the others, you can do that or leave them all at an even height. 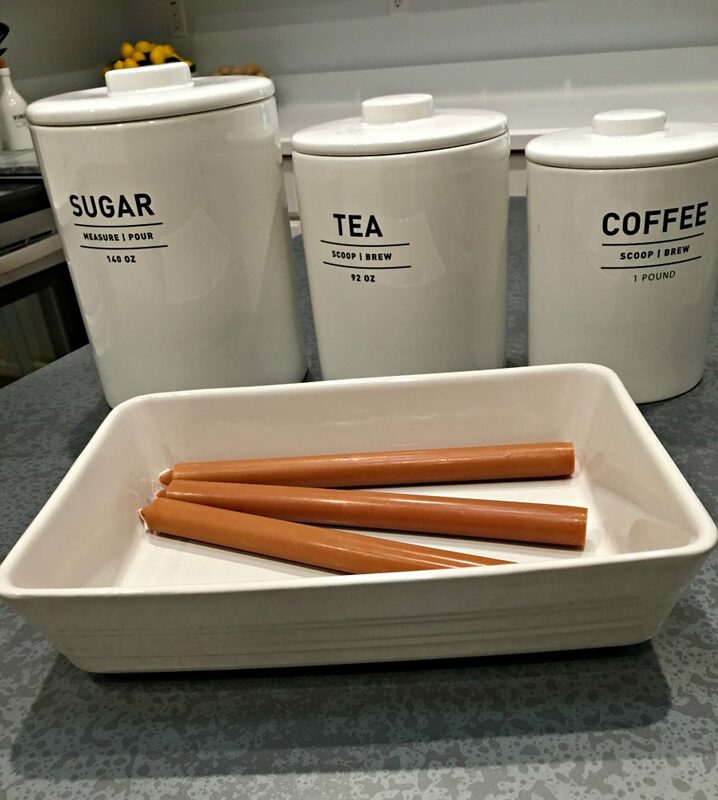 I decided my base would be these bleached preserved leaves from the Knud Nielsen Company. You can use preserved leaves or artificial leaves. It is easy to break off pieces of the leaves or cut them with wire cutters from the main stem in smaller pieces and push them firmly into the foam all around the edges of your container. Angle your stems of leaves down toward the table. Your container will hardly show when you are finished with your arrangement. After the leaves are in, all around the edges, you can start to add your next layer, I selected neutral berries and picks to my arrangement. I decided to add a golden antler to my arrangement, just setting it on top of the foam. It won’t show too much when my arrangement is finished, but I didn’t know that at this point. 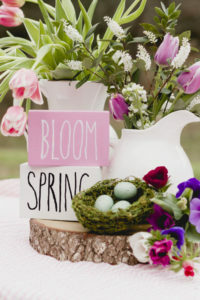 Start building up the arrangement with artificial blooms in your choice of colors. 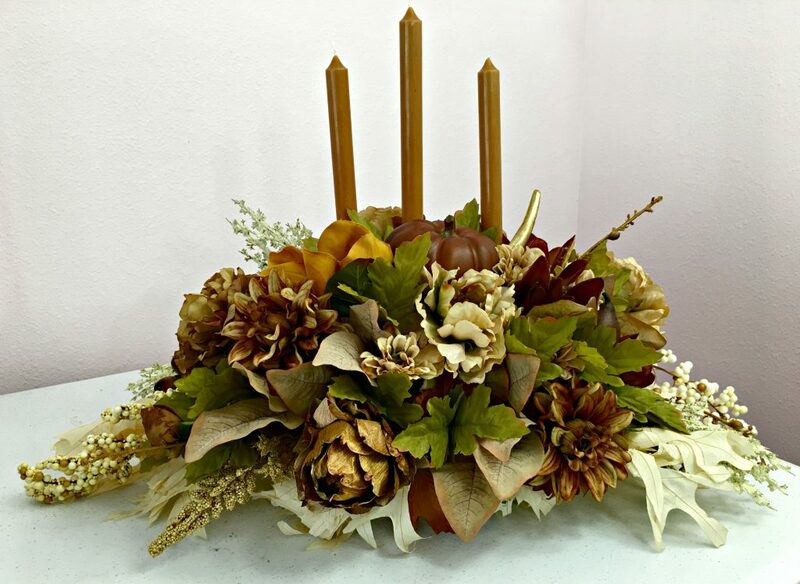 Finish up the shape of the centerpiece with additional faux flowers, gourds or pumpkins, or even dried artichokes like I used. This looks finished, doesn’t it? I dug through my bins of leftover stems of silks and found stems I had taken the blooms off of and used my steel pick machine to add picks to tips of green leaves. Look at what a difference adding the green leaves makes in this arrangement. You wouldn’t think such a little thing would make much of a difference. 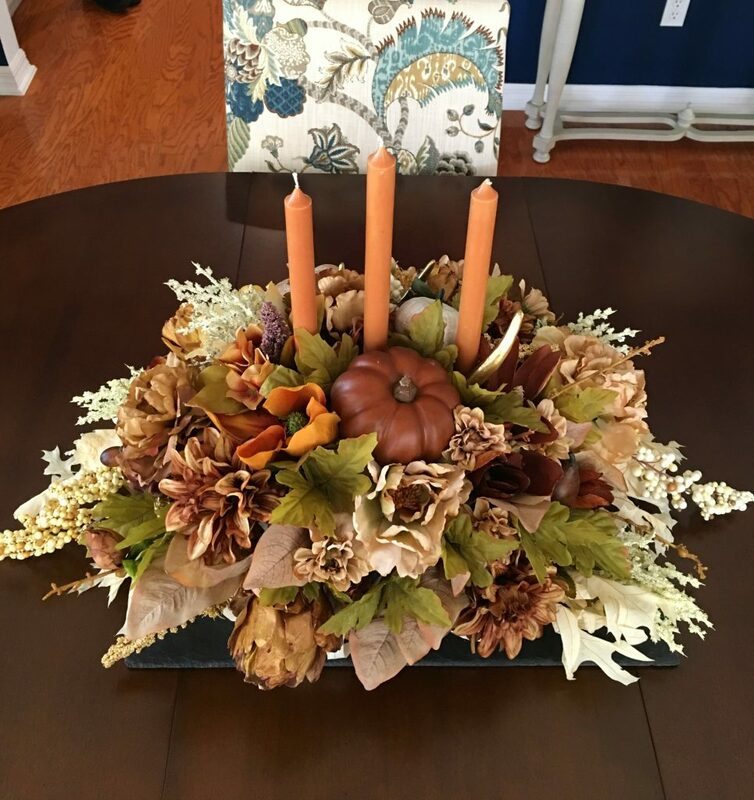 My fall centerpiece is on display on my dining table, ready to greet guests for meals through October and November! 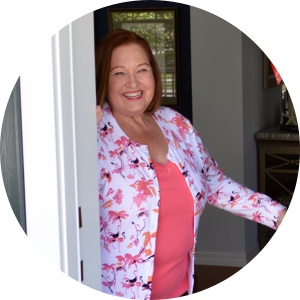 I will be demonstrating the tutorial on this project live on Hometalk’s Facebook page on Friday, September 29th at 1 PM ET. 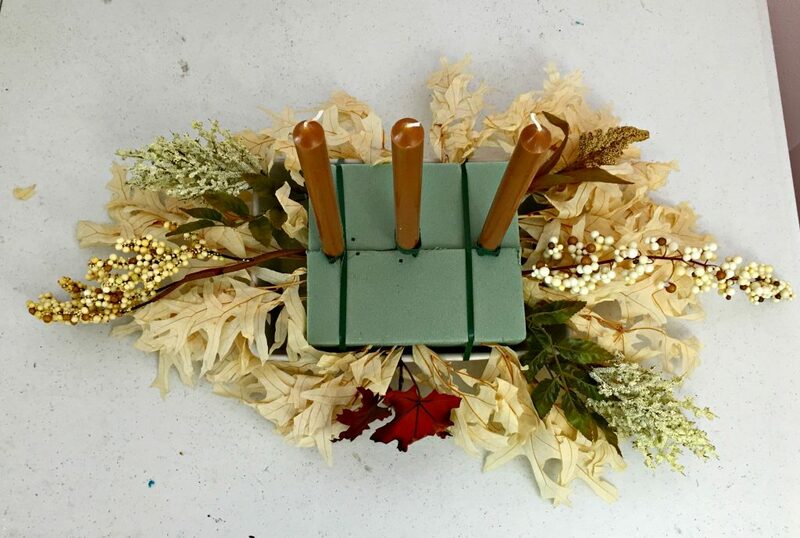 This is a centerpiece you can easily replicate in your own container and in your choice of colors! Thank you Lori! You never know what you might find under the flowers on my table! Hey Chloe Crabtree…! this is amazing and i really like your idea. i will tried to make for decor our home. Thanks for sharing and keep shared your new ideas. Thanks Donna! 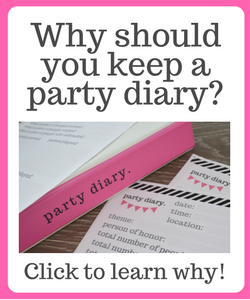 I hope it is easy enough for anyone to follow along! Very pretty Chloe and it looks very easy to put together. Thank you , have a blessed day. Thank you Sandy! I hope it is easy enough that anyone can tackle it! I wish you a blessed day, too! Thank you Sue! Thanks for stopping by Celebrate & Decorate! Very clever Chloe! It’s beautiful!!! I will forever be looking at my casserole dishes in a new way! Thank you Jenna, I just wanted folks to know they don’t have to invest in a special container for a holiday centerpiece. 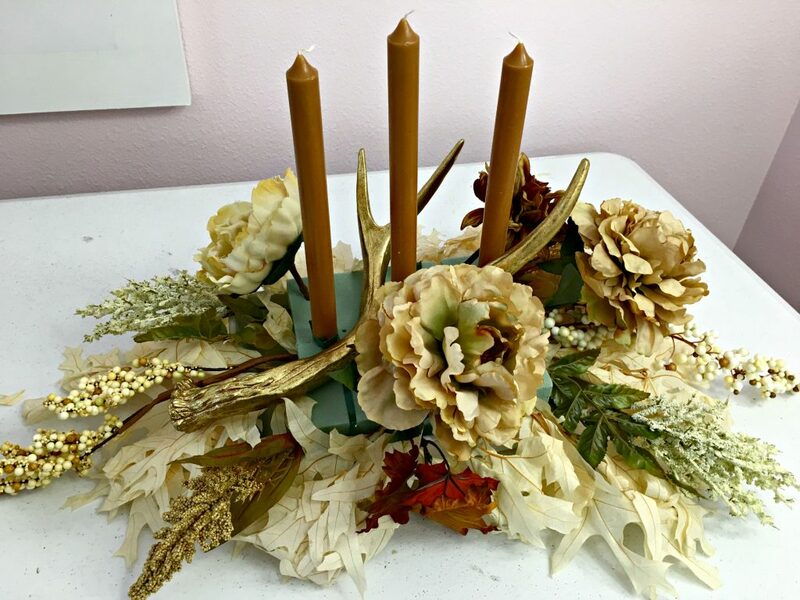 Thank you Donna, I wanted to showcase that you don’t have to buy a special container, you can use anything you have around your house to make a pretty centerpiece. WOW! What a great idea!! I love the flowers, etc. that you used and the colors. Beautiful job! Thank you Lauren! It was fun to do something in neutrals for a change! Beautiful Chloe and you make it look so easy! I have several cake pans that I don’t use anymore and they would be great for this. Thank you for the tutorial! Thanks Sandra! I, myself am thinking of using an old jelly roll pan for an arrangement with a lantern in the middle of it! 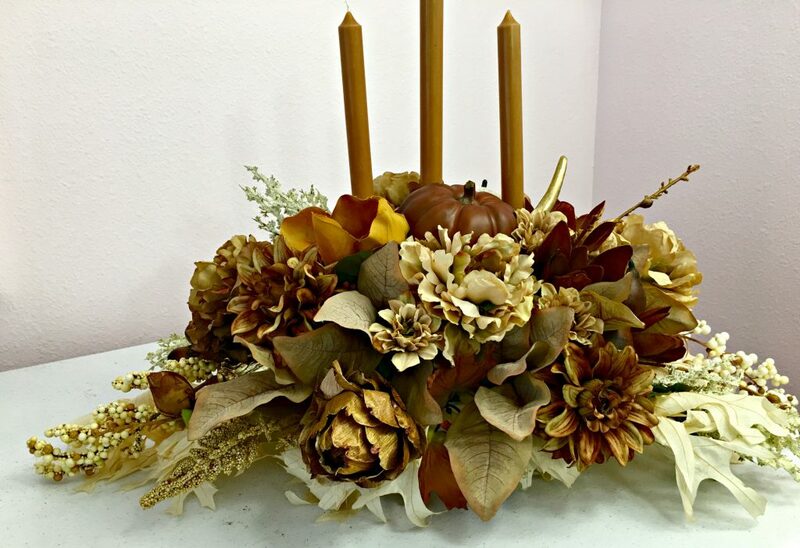 Thank you so much Michelle, sometimes it is fun to put together a fall arrangement without reds and oranges!